Yesterday, I finally drew up the courage to venture all the way across town to the one and only golf course in the entire region (including Lebanon, Syria and Jordan). I’d thought the treak would prove extremely complicated, but in the end it was quite simple! The Lebanese Commuting Company bus number 6 took me all the way across town to the Cola Roundabout, and from there it was only a short ride with a taxi “service” to the Golf Club of Lebanon. All in all the journey takes barely an hour, includes some great sites along the way — Now I know how to get to the National Museum! — and costs only 1750LL (about $1.50 Canadian) in fares, one way. 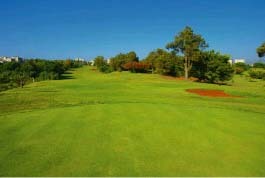 The golf course is beautiful, a hilly terrain (not as much as one might expect for Lebanon, however) and it is reasonably well maintained. There is a lot of grounds work underway, but the greens are “rugged” showing the effects of the Lebanese winter. I hire the services of a caddy — for the first time in my life as golfer — and this proves to be a very wise move. His name is Ali and he not only knows the golf course — this is particularly helpful in reading the greens, but he gives me some helpful pointers, and has a keen eye for spotting balls in the rough — my slice has returned! An English speaking golfer joins us along the way, Bob Morton, who happens to be a Canadian as well, from Edmonton. He is a retired civil servant who worked for the Alberta Ministry of Finance for most of his career. He is in Lebanon with his wife who is teaching English in Beirut on a two year contract that will end this summer. The course was quiet yesterday, and Bob tells me that this is usually the case. There are only about 100 club members who actually play golf — most join for the swimming and tennis facilities. The course is quite near the famous Palestinian refugee camps of Sabra and Chatila, and Bob tells me that one of the long-time members of the club reports having played golf regularly throughout the civil war — now that was quite an accomplishment! Those who have played golf with me (and who wonder why on earth I continue to play!) won’t be surprised to learn that I didn’t break 100 (far from it), but of course made about 20 shots that were splendid enough to keep me coming back to the game … and back, and back … Besides, I had such great excuses yesterday: hadn’t played since early November, first time on this golf course, and with rented (and unfamiliar) golf clubs … So what do I say at the end of the season, at my home course, with my own very familiar clubs ??? Following Evensong at the Catholicosate, Bishop Nareg suggests that we go up to Harissa to have a light supper overlooking the city below. Fr Houssig joins us for a pleasant time at a roadside Sajj restaurant high above the city of Jounieh (about 5 kilometres north of Antelias). 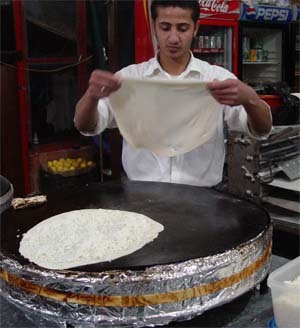 Sajj is a domed stove top on which thin bread with a variety of toppings is warmed. You might call this Lebanese pizza!